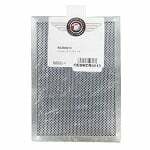 This Microwave Filter Replacement (OEMRCR0613) made by American Metal Filter Company is a compatible replacement microwave filter primarily for the GE WB02X10733 filter (also known as the GE WB2X10733 Microwave Filter). 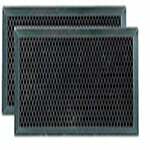 It is a recirculating charcoal carbon microwave filter for use with non-ducted over the range microwaves. The GE WB02X10733 filters and recirculates cooking odors when the microwave oven is not vented to the outside. It fits many non-convection microwave models including General Electric microwaves and Hotpoint microwaves (listed below). It can also be used for odor elimination via the use of the microwave fan when cooking on your range stove. The dimensions of this microwave filter replacement are approximately 6 3/16" x 8 11/16" x 1/4" (6.125" x 8.75" x .375"). 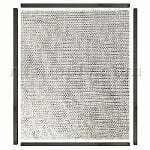 The GE WB02X10733 is constructed of a sheet of charcoal fiber overlaid with aluminum meshing. It is made to absorb odors and prevent them from recirculating in to the air in your home. As stated above, this filter is also size compatible with many range stove vent hoods. Please make sure that the specific dimensions of this filter match your existing filter before purchasing. This filter is also known by alternate part number WB2X10733. Dirty microwave filters create more strain on your microwave and range stove vent fan which limits their lifespan. This filter should be replaced about every 3-6 months depending on specific microwave and range vent usage.